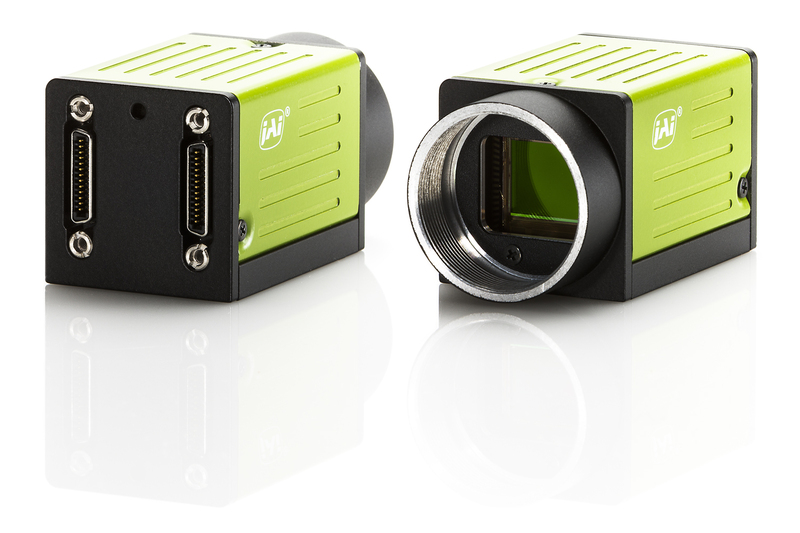 The new Go series of industrial cameras from JAI feature a 5-megapixel global shutter CMOS imager capable of delivering full resolution images at 107 frames/second over a two channel, Power-over-Mini-Camera-Link interface. Packaged in a 29mm x 29mm x 41.5mm housing and weighing just 46 grammes, these new cameras have an industrial-grade rating of 10G vibration and 80G shock which makes them suited to applications that require repetitive camera movement or on robotics/unmanned vehicles, as well as for mounting in tight spaces. The monochrome GO-5000M-PMCL and colour GO-5000C-PMCL cameras offer many of the features of JAI’s Spark SP-5000 cameras at a very competitive price point. In particular, versatile ROI and binning capabilities allow easy configuration to meet a wide range of customer requirements for resolution, speed and optical formats. The sensor’s 5micron square pixels mean that the centred 1080p or VGA ROI imaging options are fully optimised for 2/3-in and 1/3-in optics respectively, minimising the cost of optical components in keeping with the entry level pricing for the camera. The camera can be operated with a single ROI or up to five ROIs simultaneously. Multiple sensor taps and the dual Camera Link interface enable users to select the most appropriate frame rate and data rate for the application using Base, Medium or Full configurations. Power is supplied through one of the two Mini Camera Link connectors. Noise reduction facilities include a combination of analogue and digital gain controls to reduce the amount of quantised noise in low-light images. In addition, monochrome binning, both horizontal and vertical, is available for high sensitivity low noise imaging. The colour model offers a four channel analogue gain function for better white balancing and shading correction with reduced noise. The new Go series also features JAI’s Auto Level Control that combines auto gain, and auto shutter capabilities in an integrated function to let users optimise their auto exposure control for lowest noise, fastest shutter or other priorities.